Every Pancake Day, I completely forget the one sticking point to making good crepes: refrigerating the batter for two hours (or overnight). Sure, the crepes are delish but we end up late, the kitchen’s a mess, my evening downtime is wiped and so am I.
I did a Google search for “crepe recipe without refrigeration” and alakazam! There it was! A recipe from The Inadvertant Gardener for immediate satisfaction crepes, no refrigeration required. It worked like a charm, crepes were on the table in less than a half hour, and I had my evening free to catch up on American Idol. All was right in the world. Props to The Inadvertant Gardener for giving me my time and life back on Pancake Day/Night. I owe you! Whisk the flour, salt and milk together until the mixture is bubbly. Whisk in the eggs, and then the cooled butter. Heat a nonstick skillet (I used an 8-inch skillet) until drops of water tossed in the pan skitter across the surface. You’ll probably want to adjust the heat as you go, because you want to keep the pan very hot, but not so hot as to burn the crepes. Using a small ladle, add somewhere between 1/8 and 1/4 of a cup of batter to the pan. Swirl it so it covers the bottom. You’ll need to work quickly, because the batter should start to cook immediately, and if you don’t swirl fast, you won’t get it to cover the whole bottom of the pan. Let it cook about a minute, until the top of the crepe is starting to dry but hasn’t yet bubbled, then flip the crepe over. Cook the second side for about 20 to 30 seconds, then remove the finished crepe to a plate. You don’t want them to be as brown as pancakes would be – just slightly golden. Top with whatever you fancy and serve! Enjoy with American Idol! 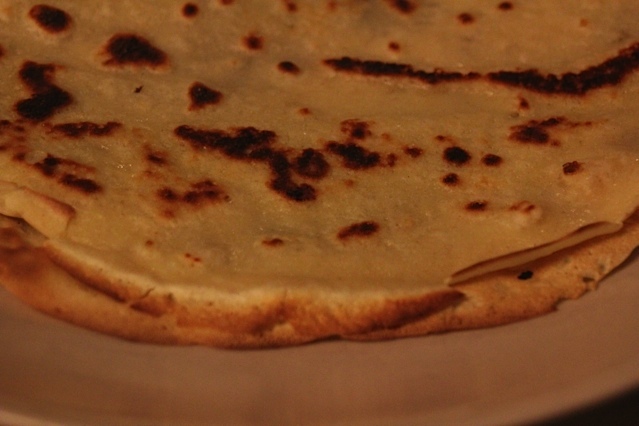 Posted on 22, February 2012, in Food and tagged crepe, pancake, recipe. Bookmark the permalink. 1 Comment. I always forget pancake day… 😦 And of course, I saw your post too late, as well!